We have been on the lookout for a new place to do our Weekend Group Mining Projects for quite some time. This is because we have done every Weekend Project on the upper bar of our Mega Hole property at K-15A for the past five years. That amounts to 35 separate projects in just one area, even though we have 80+ miles of good mining property to choose from (It used to be 60 miles, but we have grown). We kept returning there because the Mega Hole property always produces gold for our projects. 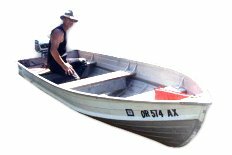 We used boats a lot during our earlier years when there were not so many people on the projects. The truth is, with an occasional exception, the better gold deposits are always richer in the places that are more difficult to get to; especially those places that are just out of reach. This is the nature of gold, and is one of the reasons it is so valuable. The upper gravel bar at the Mega Hole is still producing gold. 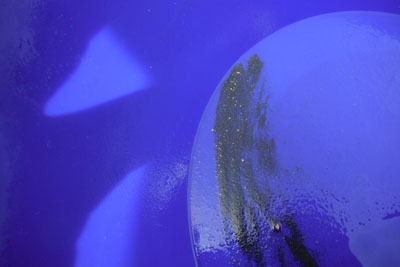 All you have to do is dig in the remaining undisturbed areas and the gold will immediately start adding up. Our Weekend Project team leaders and I are just tired of going back to the same place over and over, again. So a few weeks ago, Rich Krimm and John Rose, two of our Project team leaders, and I found ourselves looking at the extensive gravel bar on our new Elliot Bar property at K-25AB. We already know that the bar on the Highway-96 side of the river pays very well in the surface deposits alongside the river. The problem is that the existing trail down to the gold deposit is perhaps a little too difficult for some members that might arrive for a Weekend Group Project. We were expecting more than 70 participants on the first project of our season. 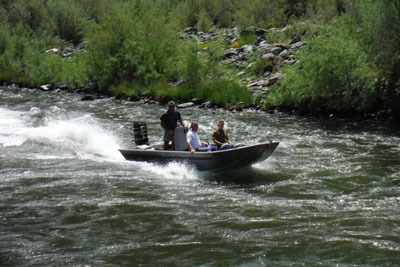 As a second alternative, we made plans to organize a small group of experienced members to meet up and make use of my jet boat to do some sampling on the far side of the river on our new A & D # 3 property at K-23AA. 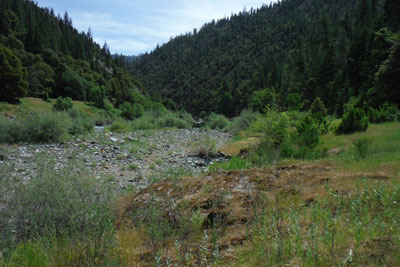 This is the property where a bunch of members did quite well last season, both in and out of the river. These numbers, by the way, identify each of our many properties on a published Claims Guide along with maps. Several days later, the day before Memorial Day, I found myself launching the jet boat with longtime supportive members, Rich Krimm, John Rose, Derek Eimer, Steve Jones, Sean Hart and Steve Kleszyk. Our initial target was the sizable gravel bar on the far side of the river at the top end of A & D #3. We chose this place because quite a lot of members have been doing well on the far side of the river about a half-mile downstream. John said a small family were prospecting on this upper bar last season. They told John they were pleased with the gold they were recovering. There is a pretty good trail going down to the river from the Highway 96 side of the river directly across from the gravel bar. There is also a huge pull-off for plenty of parking and camping. This place is nine miles downriver from Happy Camp. 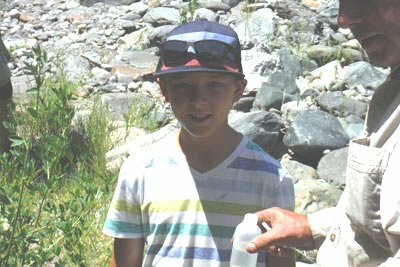 Once our prospecting team arrived across the river with the jet boat, we scattered across the gravel bar and started sampling. Initial results were rather poor. Rich and I found a place where some rocks were tightly wedged together just above where we could see some exposed bedrock. We were wishing we brought a pry bar along. Our progress was moving along slowly. 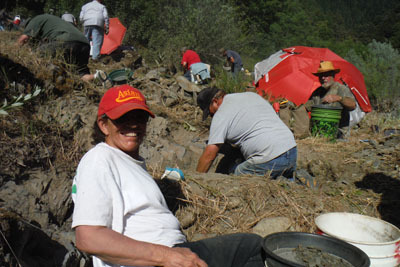 The results in our gold pans were not getting better as we dug deeper, which is also often the case when we are beginning from scratch in a new location. 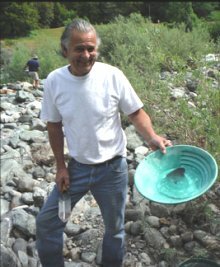 We had been out there for perhaps thirty or forty minutes when John came over with a pan with maybe 15 or 20 gold colors in it. It was a good pan. It was a heck of a lot better than what the rest of us were finding. I felt this huge sigh of relief as soon as I saw the gold. The first moment of an important gold discovery always takes my wind away just for a moment. This is the moment of magical alchemy, when something of little value is suddenly turned into raw wealth. There are not very many other experiences in life that are so exhilarating. 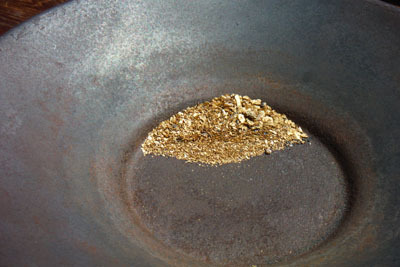 Derek followed just a few minutes later with about twice as much gold from a single pan. Eureka! 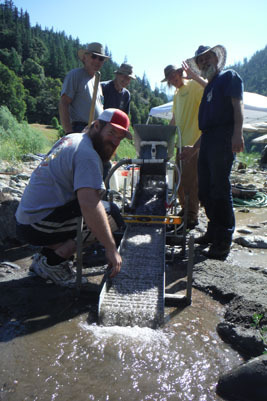 The rest of us immediately gathered up our prospecting gear and followed Derek and John to where they dug their samples. 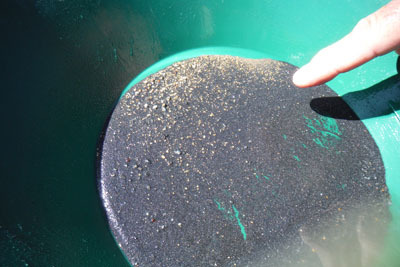 It does not take very much gold in a sample pan to signal an important discovery. This is because the volume of material processed in the sample is very small. 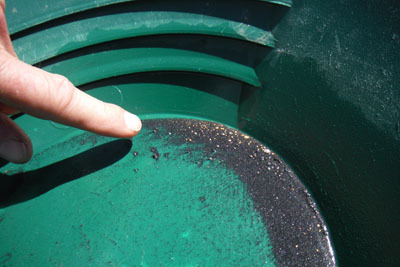 We then follow up with more tests to establish exactly where the gold is coming from. Further testing is done along the trail that leads to the richest material. 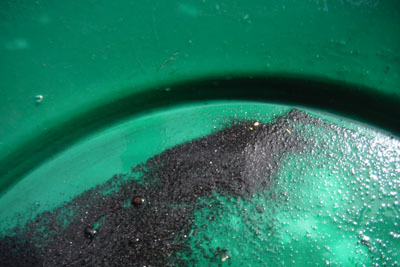 Then the amount of gold in a single pan, or perhaps even a 5-gallon bucket, needs to be related to how much volume of material we can process once we get into production. There are a few important lessons here that are worth pointing out: The first is that your chances of making a good gold discovery in a new place are vastly improved when you go out with a group. If Rich and I went out there alone, we may never have made the strike. Perhaps the most important lesson is to keep your ears and eyes open all the time when you belong to an active mining association like The New 49’ers. The reason Derek and John were sampling in that place was because they had watched where the family was mining last season. 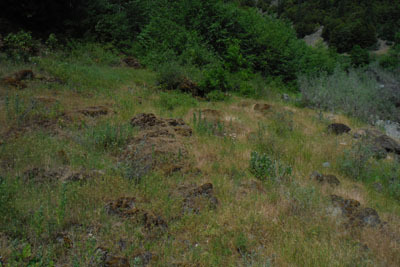 Once the rest of us got over there, we could see where the earlier prospectors had been scraping bedrock. John and Derek had just picked up where they left off, and that’s all it took. We got ourselves a brand new strike! 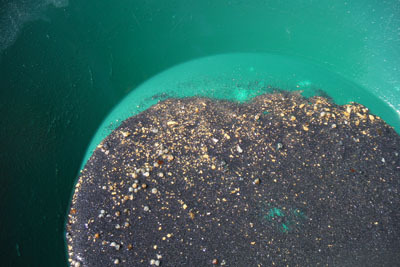 It is challenging to separate fine gold from volume-amounts of sand, difficult to accomplish with a normal high-banker. 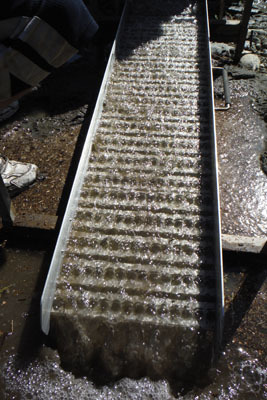 Ultimately, we pulled together three Le Trap fine gold recovery sluices and connected them to a single water pump down alongside the river. We normally use these Le Traps to concentrate the material from our high-banking and suction dredge recovery systems at the end of the day. They are very effective, but a bit slow to keep up with volume amounts of material. 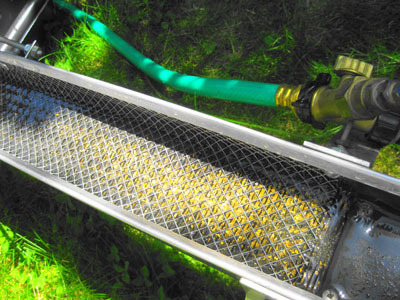 Derek also offered up his new Gold Well recovery system, which, I believe, is the most exciting gold processing system on the market at this time. 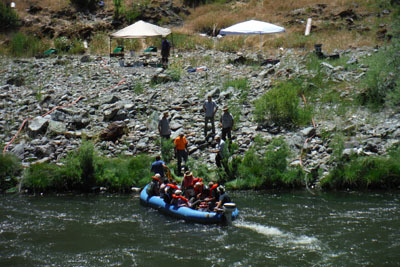 Then we pulled one of The New 49’er Colorado River rafts out of storage and pumped it up. We did not expect it to hold air. This was because we have not used the big rafts for about 6 years. But the quite sizable boat blew up like it was brand new! Then we added in the floor boards and pulled out the outboard engine. The outboard had been worked over just a few years ago. Once we got it started and ran it awhile, it sang like a well-oiled machine. 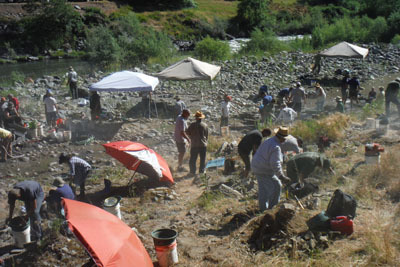 Later that day, our whole prospecting team and some more members loaded everything up and hauled it down to A & D #3. 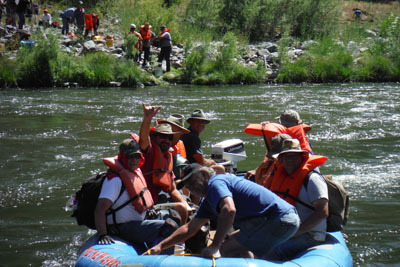 That Colorado River Raft is so tough; we just slid it down the hillside and into the water. There were 78 members signed up for the project on Saturday morning. This was an enthusiastic, friendly bunch. We met over at the Happy Camp Grange Hall where I introduced our team leaders who would help manage the project. We are so lucky to have a bunch of experienced members that enjoy helping with these Group Projects! I then provided the group with my talk on how to pursue a sampling program. Motorized raft is the way to go! Since we had already made the gold strike, the only real objective for my team on Saturday afternoon was to teach beginners how to pan for gold. We consider that as one of our most important responsibilities. This is because the whole sampling process comes back to effective panning skills. If you cannot pan, you cannot sample. If you cannot sample, the only way you are going to find high-grade gold is if someone else gives it to you! At least 2 nice nuggets were panned on Saturday afternoon! We do a New 49’er potluck every Saturday evening during the summer months. This meant we needed to get all these people back across the river so they would have time to freshen up for the evening event. Once the beginners were all lined out, me and my team mates were eager to start transferring people back across the river. But they didn’t want to go! There was so much fine gold in their pan samples, just about all of them kept saying, “just one more pan.” We literally had to peel the last of them off the gravel bar late Saturday afternoon. Truthfully, I was worried some of them were going to hide over there so they could continue mining. There was no other way back across the river unless they wanted to swim. Gold does have that effect on people! It was a full house at potluck on Saturday evening. The enthusiasm and excitement was so noisy, it was challenging for me to get the meal started! After a bunch of great food, we had a short meeting, did our weekly prize drawing, and let everyone go home earlier than normal. This is because we were planning to meet out on A & D #3 at 6:30 the following morning. We have found over the years that it is better to start early on Sunday so we can get most of the physical work done before the heat of the day sets in. The whole objective on Sunday is to come together in a well-organized team to process as much pay-dirt as we can. The parking lot looked like Woodstock! The bedrock & sand is laced full of fine gold! I had left word up in the parking lot that I would return with the boat after a while for any stragglers. Thirty minutes or so later, I was stunned by a very directed shout from across the river. Sure enough, there were enough people over there for another boat load. It was lucky someone over there had a strong voice. By then, I was so involved with all the productive activity that I might never have remembered about stragglers! Emily & I are loving this! It is a good thing we brought Derek’s Gold Well recovery system to support this project. The easy digging in the sand and shale, along with the very substantial energy of this group, was producing screened pay-dirt several times faster than the three Le Traps could process the gold out of it. If you try to process sand too fast, you will overload the recovery system, and the gold will just wash out with the tailings. This crew was doing it just right. Excess pay-dirt was being directed to Derek’s crew on the Gold Well. And even the Gold Well could not keep up. That’s what happens when you have 70 people filling up buckets as fast as they can! Look at all that gold! 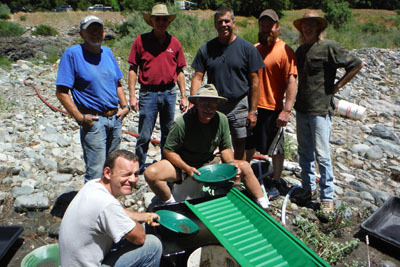 We cleaned up the Gold Well and one of the Le Traps at about mid-day, just to see how we were doing – and the amount of gold was even shocking to me! This bunch was so jacked up; at least half of them did not even stop digging to take a look at the gold! The buckets just kept coming and coming. Pretty soon, we were filling extra wash tubs because we were running out of buckets! We stopped the digging at around 11 AM. This was because we had already dug more pay-dirt than we would have time to process. The crew went around and filled the few holes we had dug. There were not many. 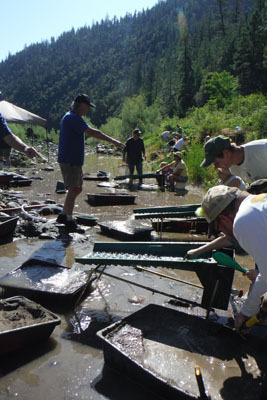 This gold discovery is mostly resting on exposed, decomposed bedrock. In most places, after you scrape it off, you are left with clean bedrock and no hole to fill in! Eventually, we were all down watching the recovery systems struggle with more material than we could feed even if we stayed out there for another hour or two. 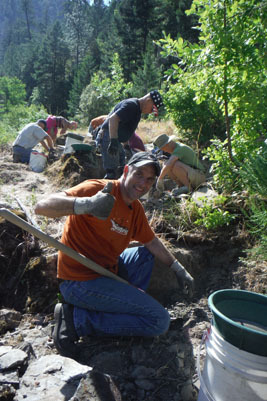 Get this: In nearly 30 years of doing these Weekend Group Mining Projects, this is the first time the digging crew ever supplied more pay-dirt than we had time to process! So I called a meeting to order out there on the gravel bar and made a motion that we split up the remaining pay-dirt into buckets and allow everyone who wanted a share to take it across the river to process at home. The motion was passed unanimously, and at least 30 buckets of pay-dirt were carried off towards the raft without any delay. The material disappeared so fast, it was as if it were never there! We met back at the Grange Hall at about 1:30 on Sunday afternoon, and all worked together to complete the final gold separation. Then we split the gold. It was the most fine gold I have ever seen on one of these projects. There were 10 small gold nuggets. 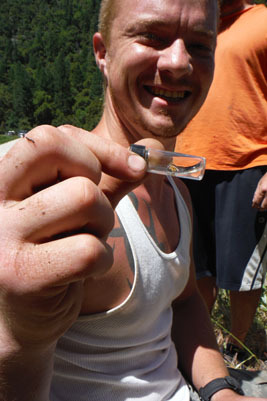 In the end, we split off a half-ounce of gold between 70 participants. There were lots of smiling faces. That’s the part I like the most. All of the briefs have been filed with the Third Appellate District, and they have just scheduled this 28 July for oral arguments concerning the Eighth Circuit’s Decision on federal preemption. This development is a hopeful sign that we are going to get the hearing we have been asking for on this very important matter. Here is how the Eighth Circuit weighed in. And here is a short update memo from our attorney. If we win this important challenge, we suspect the Appellate District will instruct the State of California that they cannot cite prospectors for using suction dredges unless the activity violates reasonable and lawfully-issued permit regulations. Meanwhile, in a completely separate case, we are making similar arguments challenging the existing Moratorium in front of the Superior Court of San Bernardino. If we win that motion, we anticipate that the judge may order the State of California to immediately resume issuing suction dredge permits. During a motion hearing last month, the judge Ordered that we attempt to settle all of the mining-related issues in front of him on June 24th before he issues a Decision concerning federal preemption. Here is a short memo from our attorney which provides further explanation. I will personally attend the mandatory settlement discussions alongside our attorney in San Bernardino in just a few weeks. Cross your fingers that this will lead to the judge deciding for us on the federal preemption motion. Please take note that we only have 3 more weeks remaining in The New 49’er Legal Fund active fund-raiser. We will be giving away 25 gold and silver coins during our weekly potluck in Happy Camp on July 5th. To date, the Legal Fund has only brought in $2,124 in contributions to support this fundraiser. That’s only somewhere around half the value of the gold and silver prizes that will be given away. Ouch! This will be the last newsletter we send out before the drawing. So I am I encouraging you to send in some contributions. This is how we generate the necessary funds to pay for legal support. Our 2-day Group Mining Projects are one of the primary benefits of New 49’er membership which set us apart from other mining associations. The remaining weekend events for the coming 2014 season are scheduled for June 21 & 22; July 12 & 13; August 2 & 3; August 23 & 24. These events are free to all members. We appreciate it if you contact our office in advance to let you know that you will attend: 530 493-2012. 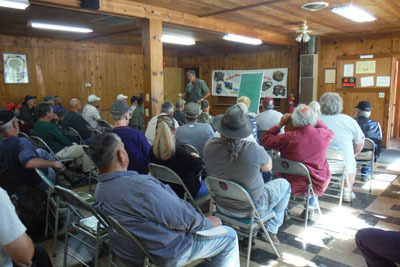 We have free long term (dry) campgrounds available to participants who prefer to enjoy the complete outdoor experience. There are also private RV and other lodging options in and around Happy Camp for those of you who prefer more accommodations. The staff in our office will go out of their way to help you with your individual needs. Montine specializes in helping you guys get the most enjoyment from your visits to Happy Camp. Here are our contact details. 4) There is no problem with booming (motorized suction mining) 100 yards or more from the active waterway. There is also a way to boom using blowing methods (see below) which should not be affected by the 100 yard rule. Please note that all surface mining activities on New 49’er properties are governed by our internal set of Surface Mining Guidelines. 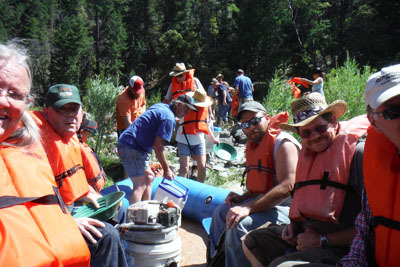 5) Underwater crevicing is what most active members were doing within the waterways at the end of last season. Some were using the hookah and pump from their 5 and 6 HP motors on floating platforms to provide air for breathing and a jet of water to help blow material out of the way. Our attorney agrees this cannot be classed as “suction dredging” under California’s expanded definition.